I loved selling my property to Revestors. It was great because I didn’t have to endure the intrusion of people marching through my house day in and day out. They made the process easy, smooth and laid everything out for me so it was nice and clear. They coordinated all the paperwork with escrow and there weren’t any unknowns or surprises that I had to deal with. The goals never changed because the arrangements were laid out effectively from the beginning. I would without a doubt recommend them to my friends and neighbors. Call us and tell us about the house– Quick, Easy & Free! The hardest part of all this is actually calling us. That probably takes the most effort because the rest of the process is EASY and HASSLE-FREE. Timeframe: Once you call us to give us some information about the house, we’ll go ahead and set up an appointment for us to physically see the house and determine the most accurate and best cash offer for you. Setting up the appointment usually happens within 24 hrs. From there, we can close as quickly as 7 days… or on your schedule. We understand that in this industry, there is some skepticism about these “We buy houses” companies all over the city. They come back to you to renegotiate when they can’t find a buyer. 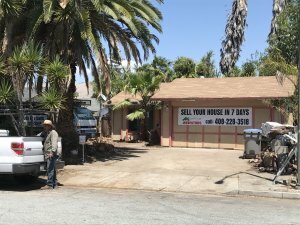 REVestors LLC buys houses using their own cash in and around San Jose (and other areas too!). We’re not listing your house … we’re actually the ones buying your house. Because we pay cash, we’re able to close quickly… or on your schedule.